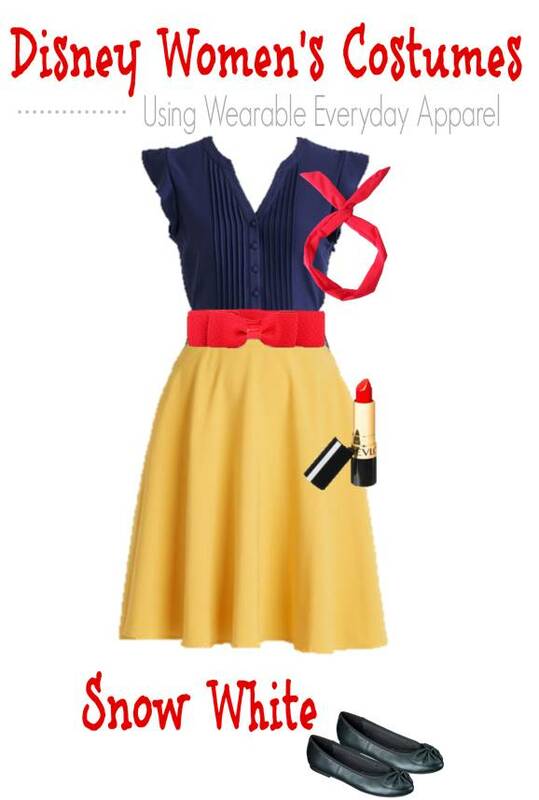 DIY Snow White Costume (Using Regular Clothes You Can Wear Again)! Each year my kids want me to dress up with them. But it seems that I have spent so much time preparing for the Halloween party we host at our house, and making sure they all have all the parts that they need for their costumes, that I don’t have much energy left to run out and get a costume for me. I remember one year though, when I raided my husbands closet and threw together a scarecrow costume in just a few minute – and the kids just loved it! One year when I was a teen I dressed up as Snow White, in a costume very similar to the one we have listed above. My kids look at that picture and beg me to do it again, so I thought this adult version of the costume was a great idea! We were inspired by our own experiences to put together a series of costume ideas that were super simple for busy moms as a result. We also know there are many Disney fans out there, so we thought it would be great to do a play on many of the Disney princesses, but for women! This way you are not throwing money away on a costume you will wear one time only.